This article will go through the customization of the RadTreeListView to look a like RadTreeView control. The article explained the benefit from using our RadTreeListView control for visualizing hierarchical data as ordinary hierarchical control like RadTreeView. The reason why we suggest the approach is the fact that RadTreeListView is a flat control. This means that it uses only one container to visualize all of its items. What this means for your application is that you can boost the performance of the scrolling and bringing into view functionalities, as well as the virtualization. Those of you who are already familiar with the visual structure of the RadTreeListView control may say that it is much more than a hierarchical control. They would be right, this control derives from our RadGridView and inherits some of its functionalities along with its column generation algorithms. Of course, you may not need all that information and functionality, this is why the RadTreeListView exposes properties that can be used to customize the control. You can practically hide everything that makes it look like RadGridView. The following style changes the look of the control and styles it like our RadTreeView control. The League has a collection of teams. 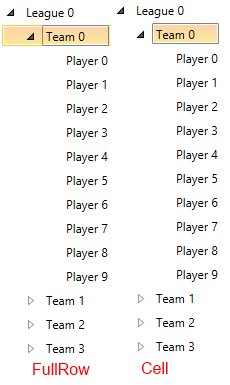 Each Team has a collection of players that is called Items which does not have any further collections. Example 2 demonstrates the data structure. Now we can go ahead and create our hierarchical data. The RadTreeListView control is designed to use TreeListViewTableDefinition to visualize its items. You can use the TreeListViewTableDefinition.ItemsSource property to recreate the requested hierarchy. You should keep in mind that the RadTreeListView expects that the collection holding the children of each level is always named the same way. To enhance the hierarchical visualization you can allow the RadTreeListView to visualize lines connecting the items of the same level of hierarchy. This can be done by setting the RadTreeListView.TreeLinesVisibility property. Figure 3 shows the effect of the property Wwhen it is set to Visible the result will be like the following picture. You can download a runnable project which demonstrates similar structure from our online SDK repository here, after navigating to TreeView/TreeListViewBringItemIntoView.